St. James Trinity is the fortunate recipient of a beautiful spinet piano, a special donation from former Pastor Joanne Sorenson. This piano was likely born in Minneapolis around 1956. It was owned by Pastor Joanne’s aunt, Joyce Peterson, the woman on the far right in the picture. She is sitting on the arm of a chair, next to Joanne’s mother, the woman with the corsage. The piano, not shown in the picture, is beside the lamp. Apparently, the piano was shy! But when the cameras went away, the piano rang out beautiful music. 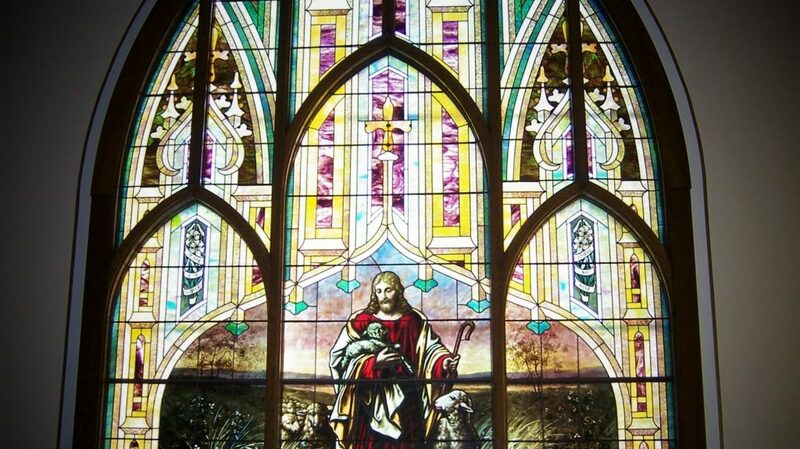 The family used to huddle around it and sing hymns together. 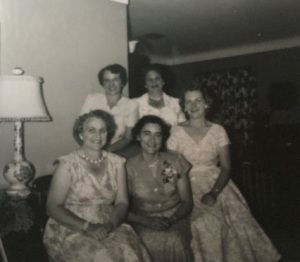 Many fun musical piano memories remain for these woman and other family members. The piano was gifted from Aunt Joyce to Pastor Joanne. It followed her to the St. James Trinity parsonage. When Pastor Joanne downsized to a small apartment in St. Paul, the piano moved with her son to his apartment in Eau Claire. Now that he has moved to the west coast, the piano needed a new home, a place of comfort with loving people and Christian hymns. The choir unanimously accepted this gift from Joanne. Several Council members helped to move it to the fellowship room by the church offices. The piano will ease the times of basement over-booking during Lent suppers, Sunday coffee/choir rehearsal, and other times when the organ is in use and the upstairs piano is not available. In addition, the children will be able to practice their songs during lesson times and for special services. The piano is a Baldwin Acrosonic. The word “acrosonic” is taken from the Greek work “akros,” meaning supreme, and the Latin word “sonus” meaning tone. It was known as a piano with supreme tone. This small piano weighs only 368 pounds and has beautiful curved legs. 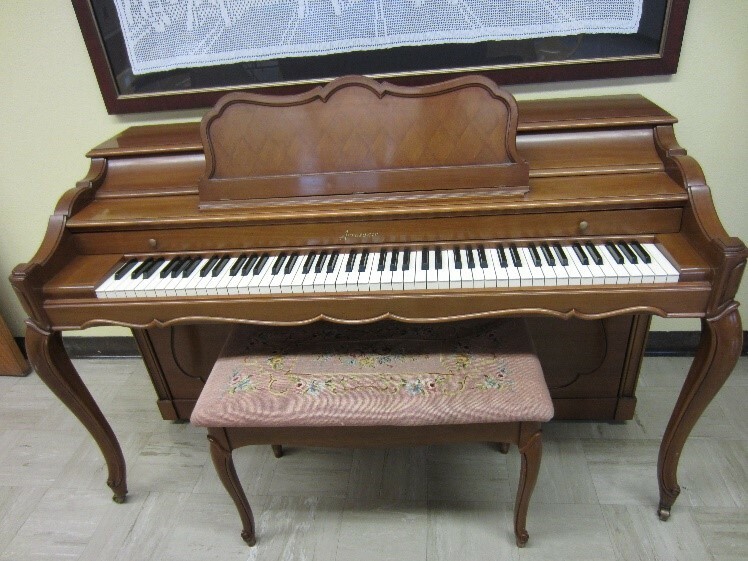 Back in the day, Baldwin Acrosonics were considered one of the top three spinet piano brands. They were known to stay in tune longer, were comfortable to play, and had minimal breakage issues. Their solid spruce soundboards vibrated well, providing a better sound than their lower-end Baldwin cousins. It is even rumored that Elton John and Billy Joel were experienced Acrosonic players, though they probably played more rock and roll than hymns! A spinet piano is different from other console (upright) pianos because spinets have dropped, or indirect blow action. The keys pull upward on rods, which pull upward on levers located below the level of the keyboard. These levers then engage the action, causing the hammers to hit the strings. In non-spinet console pianos, the keys directly engage the action of the hammers against the strings. Because of the indirect action of the spinet piano mechanism, spinet pianos could be made smaller and shorter. Though spinets were not always favored, the Baldwin Acrosonic was, and still is, considered a high-quality piano. Make sure to visit the piano and take note of the beautiful hand-made needlepoint cushion on the seat. Because of her over-60-year-old delicate, curvaceous legs, it would be better to just admire her and not move her. And if you ever run into Pastor Joanne Sorenson, please thank her for sharing this beautiful instrument with St. James Trinity.